Becoming an authorized user on a credit card gives you all of the privileges of using the credit card, but not the legal responsibility to make payments on the credit card. For example, you can make purchases using the card, but you're not required to make payments. Once you're made an authorized user on a credit card, the full account history will be added to your credit report. In some cases, you can receive a credit score boost from being listed as an authorized user on a credit card with a long and positive account history. Being added as an authorized user is a good way to jumpstart your credit history if you're new to credit or you have a troubled credit history. The positive account history from being an authorized user can help you qualify for credit on your own. If you later decide to remove yourself as an authorized user, you may be afraid that your credit score will be negatively impacted. Your credit score could be affected if you’re removed as an authorized user, but the impact depends on that account's history, the other information in your credit report, and whether the authorized user account continues to be reported after you're removed. What Happens When You're Removed As An Authorized User? When you're removed as an authorized user, you no longer have the privileges of using the account and the credit card issuer will stop updating the account on your credit report. Depending on how the credit card company reports authorized user accounts, the account history for the credit card may automatically drop off your credit report after you're removed. The credit card issuer can tell you specifically whether the account will fall off your credit report after being removed as an authorized user. If the authorized user account doesn't automatically drop off your credit report after you're removed, you can send a credit report dispute to have the account removed from your credit report. You may want to do this if you believe the account is hurting your credit score. For example, if the account holder made late payments or has a high credit card balance, the account could hurt you more than it helps. On the other hand, you may want to leave the authorized user account if it's helping your credit score - at least until you've established credit in your name. You can ask the credit card issuer how the account will show up on your credit report after you're removed as an authorized user, if it shows up on your credit report at all. Or, you can verify by checking your credit report 30-45 days after you're removed from the account. Being removed as an authorized user can hurt your credit score if the account is removed from your credit report. For example, if the authorized user account was the only positive account on your credit report, you could see your credit score drop after removing yourself as an authorized user. Or, if the account was the oldest account on your credit report, you could also see a drop in your credit score. On the other hand, if the account history for that credit card was negative, e.g. late payments or high balances, your credit score might improve when your authorized user status is removed. If you lose credit score points after you're removed as an authorized user, you can typically get those points back over time by building your credit score with your own credit accounts. If you're the primary account holder, removing an authorized user won't affect your credit score. The account will continue to be reported on your credit report as normal. Can You Go Over Your Credit Limit? 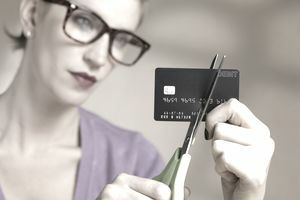 Can Your Credit Card Become Inactive If You Don't Use It Enough?